Looking for a holiday gift for a special wine lover in your life? 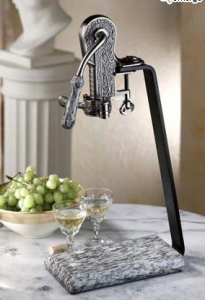 How about a quality wine opener? Rogar wine openers were originally designed in the late nineteenth century to meet demands from restauranteurs for a professional wine opener that could get the job done fast. Today, Rogar wine openers remove the cork in under a second. One of Rogar’s premiere lines is the Rogar Champion opener series. Champion openers can both uncork and recork the bottle with speedy ease. 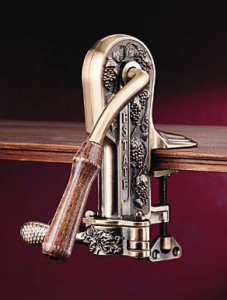 All Champion wine openers feature the Rogar original design: a vine-and-flowers theme that’s classically beautiful. 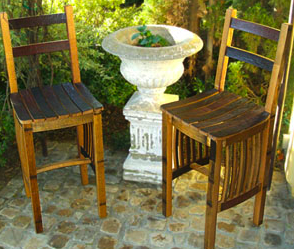 The base is made of die-cast zinc, and the top can be finished with nickel or pewter, and there are both wood and granite options for the stand and handle. 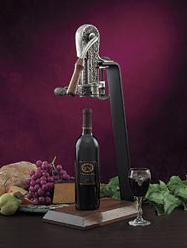 The Rogar Champion line has timeless elegance that any wine lover is sure to appreciate for years to come. Rogar Estate openers are another beautiful option. Their gorgeous designs make them timeless pieces that will never go out of style. This particular model has an antique bronze finish and a hardwood handle. It features an ornate design of grapes and leaves. 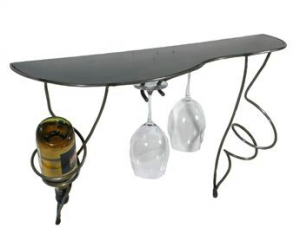 It can be clamped onto a bar, shelf or table for a classic barroom look, or it can be paired with one of Rogar’s stands for a beautiful, self-supported look. If you’re looking for that perfect wine gift for the wine lover in your life, you can’t go wrong with a beautiful and functional Rogar wine opener. 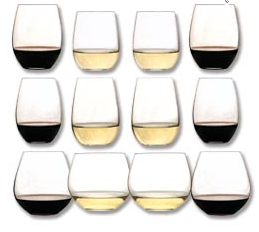 But if you’re going to go to the trouble of picking out and purchasing a bottle of wine for your hosts, you don’t just want to plunk it down, unadorned, in the center of the table. Gift wrapping a bottle of wine adds an appropriately festive touch. But how to do it? 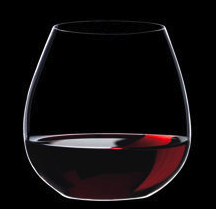 Wine isn’t box-shaped, after all (Well, some is. But you really shouldn’t be giving that kind as a gift). The simplest method for gift wrapping wine is this: set the bottle in the middle of a large square of tissue paper or colored cellophane. Gather the edges up at the top of the bottle, and tie with a pretty ribbon (you can also hang a nice tag from the ribbon identifying yourself as the awesome gift-giver). This method is pretty, and totally simple (sorry men, you can’t get out of wrapping this present). Another method is to just wrap the label. This makes for an elegant presentation. 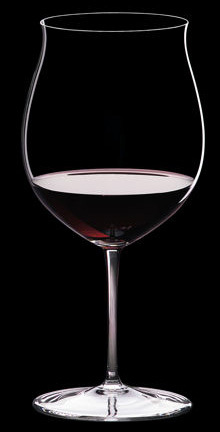 It also allows you guests to easily identify the gift, while still being surprised by the kind of wine in the bottle. To do this, use ribbon edged with wire, wrap several times around the label, and secure the end with a small-stick on bow in the complementary color. Do you have any great bottle-wrapping techniques? We’d love to hear your ideas! 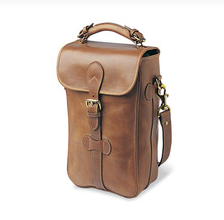 Mulholland is a maker and purveyor of fine leather products. Their goods only improve with age, and will last for generations. 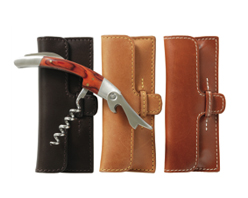 Mulholland’s line of leather wine bags was developed for the true wine connoisseur. They are perfect for carrying wine to a party, a picnic, or even across the country. Mulholland makes wine carrying bags to hold one, two, or six bottles. The six-bottle carriers are also available in a rolling style perfect for transporting your beloved bottles through busy airports. All carriers are made with a semi-rigid insulated nylon liner that maintains the temperature of chilled whites and champagnes, and protects red wines from temperature extremes. Each comes with a handle and shoulder strap, and all are shipped with a free stainless corkscrew. For the wine lover who also enjoys fine liquor, Mulholland makes flasks from their premium leather. These flasks are stainless steel and wrapped in one of Mulholland’s two leathers: the Lariat or the Latigo. The Lariat is a strong, honey-brown leather that ages beautifully, acquiring a surface etched with marks from daily wear. The Latigo is a rich, dark leather cured with natural vegetable extracts. 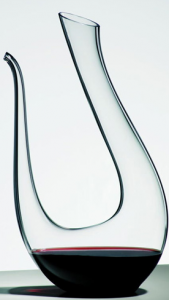 Its distinctive sheen makes it a beautiful material for all of Mulholland’s crafts. Flasks are available in 4 or 6 oz styles, and include screw caps that are hinged to the flask’s surface, ensuring they will never be lost. 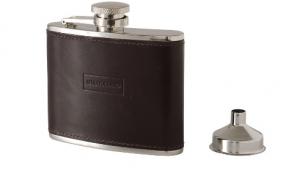 Mulholland’s flasks are crafted with the finest workmanship, and make stunning gifts. It’s no secret that many wine lovers are avid golfers. The ultimate golfing gift? 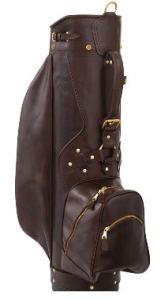 One of Mulholland’s all-leather golf bags. Handcrafted from the signature leather that has made the name “Mulholland” synonymous with “fine leather,” a Mulholland golf bag is a gift that will last a lifetime. Made of only the hardiest, most durable leather, a golf bag by Mulholland will acquire a unique patina of scrapes and scratches that will tell the story of your golfer’s years on the links. These golf bags are divided into three sections and come with several accessory compartments, as well as adjustable shoulder straps, leather trunk handles, water-repellant rain hoods, and umbrella holders. Consider gifting the golf lover in your life with the ultimate in beauty and function: a leather golf bag by Mulholland.